Happy July 4th, everyone! I hope you have a celebratory day, filled with good company and good food. Steven and I are having a low key holiday at home this year. The avenues are quiet, the cars have all been driven away, and the city feels uncharacteristically spacious. Part of what I love about New York is its grittiness and bustle and noise, but when the city is empty over these long summer weekends I can admire it in a different way, peeking at what lies beneath the hectic daily tapestry. My summer travels this year will begin after July 4th. This coming week, I’ll be flying to Denver to spend some time with my friend and fellow blogger Ashley. Why? Because Ashley has graciously agreed to be the photographer for my next cookbook, and we’re going to be working on the first photo shoot together. I’m a huge admirer of Ashley’s work, and I can’t believe how lucky I am to partner with her for this project. She’s already proving to be an invaluable source of ideas and inspiration, and I suspect that by the time the book is finished I’ll have her to thank for making it possible. I’m going to take a week or so off from blogging while I’m gone, so that I can focus on the trip and the work at hand. I had every intention of making June a fruitful and productive month in terms of recipe development and testing, but I can’t say that things went according to schedule. I was bogged down by summer class, and if there’s a culinary correlate to writer’s block, I was all up in it. My recipe testing process for the last two books was overwhelming at times, but it didn’t feel creatively challenging. Perhaps it was the quick turnaround time (short deadlines on both manuscripts) or the fact that I completed the first book as I was studying for the MCAT, and in comparison to test preparation any other task was bound to feel like a reprieve. This time around, for whatever reason, the cookbook testing process has not felt easy or organic at all. A lot of it is sheer nerves: I’m amazed by how much time I spend second guessing myself, scrapping recipes, going back to the drawing board. I hope that this is all in the service of creating something that will feel authentic and valuable, but at the moment it’s hard not to be frustrated. My voice of culinary intuition is so tiny, and so quiet. In the face of this little spell of creative blockage, I’ve turned to some of my favorite books about writing for comfort. I’ve always felt that there are some parallels between writing and cooking (maybe because the processes go hand-in-hand for me: I cook, and then I write about what I cook). In the past two weeks I’ve revisited passages from Bird by Bird, Still Writing, The Writing Life, The Situation and the Story–books that have given me insight into what the creative process feels like. I don’t flatter myself that my recipe development is nearly as vital or as ambitious as the kind of artistic endeavors that the authors are trying to describe, but what makes these books appealing is that each one portrays the insecurities and ego-shakedowns that accompany creative work with honesty and humor. They’ve reminded me that creativity ebbs and flows for everyone, and we’re bound to feel shocked and abandoned when we find ourselves in the middle of an ebb. Sometimes we simply need space, distance, slowing down, and a little perspective in order to feel inspired again. So, this week is a mini-break for me, a chance to step back and share the process with someone else (someone who is admirably patient, calm, and full of ideas–Ashley never ceases to impress me). When I come home, I’ll have the remainder of the summer to cultivate my own patience and (hopefully) have some fun with the process, too. Also crucial for the creative process: inspiration from friends. Here are the beautiful recipes that caught my eye this week. I’m licking my lips over Meg’s colorful best ever cauliflower roast. 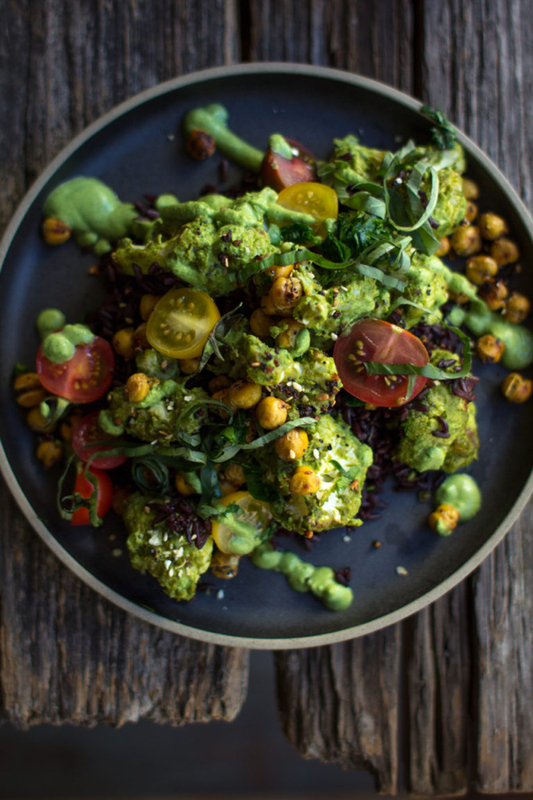 Cauliflower florets are tossed in a dreamy-sounding basil sauce, roasted, then piled over black rice and crispy chickpeas. What a fantastic mix of flavors and textures. 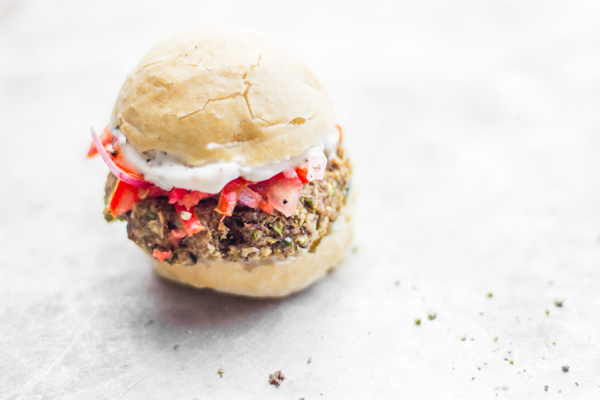 I should have posted Sheri’s scrumptious vegan eggplant sliders with oregano tomato slaw and peppercorn aioli before the long weekend, as they’re ideal for 4th of July gatherings. But summer is long, and this creative recipe will be seasonal for many weeks to come. 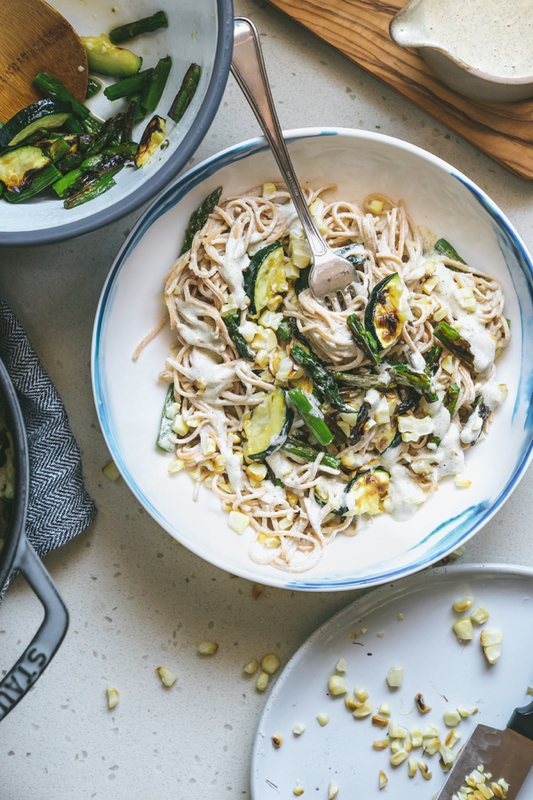 I’m so into Jessie’s zucchini asparagus corn summer pasta with creamy hemp sauce, which was apparently a casual lunch in her home (Jessie, I’m tipping my hat to you, because casual lunches around here are a lot less inspiring). When I was into raw food, I did a lot of zucchini noodle pasta meals with some sort of hemp-based sauce, and that’s what this dish reminds me of–but I love how the roasted vegetables add flavor and depth. 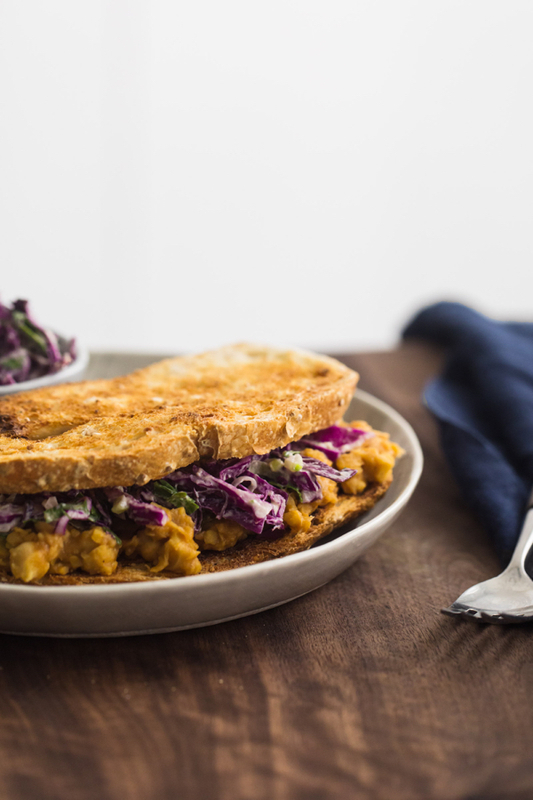 Speaking of lunches, Erin’s BBQ chickpea sandwich with tahini slaw is just about the perfect summer lunch, and I’m particularly intrigued by the peach barbecue sauce. This recipe is crying out to my love of sweet/savory things, and I can’t wait to make it. 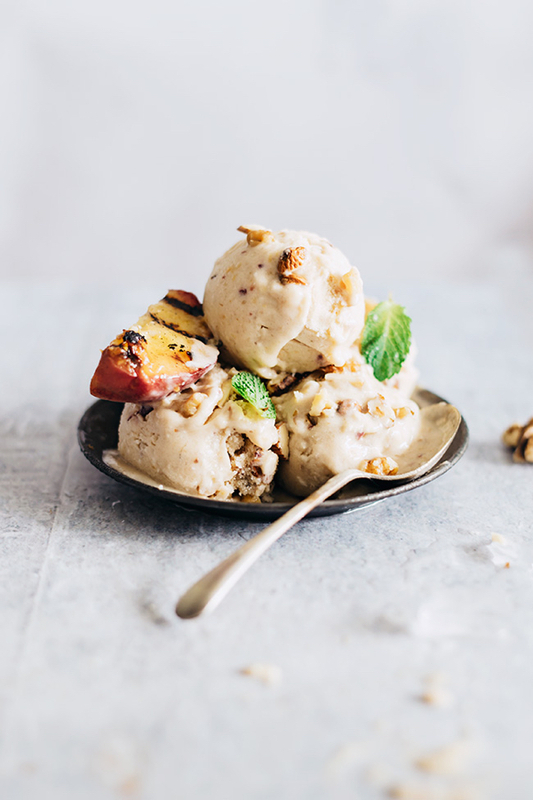 Finally, another stone fruit recipe to savor this summer: Ana’s creamy peach and walnut ice cream. I love that Ana uses banana soft serve as a base for the dish (two types of fruit on one plate!) and the grilled peaces are an inspired accompaniment. Yum. 1. The last topic we covered in my summer MNT class was diabetes, and we spent much time discussing the dangers of hypoglycemic episodes, especially for those with T1DM. I was interested to read this article on companion dogs who can detect and respond to hypoglycemic episodes, often with far more efficacy than the various alarm systems that exist to alert diabetes sufferers of a dip in blood sugar. I’m continually amazed by what canine creatures can do, and touched by the ways in which our lives can be symbiotically intertwined with theirs. 2. Since I mentioned writing advice this weekend, I thought I’d share Leo Babuta’s post on training to be a good writer. I offer it with the disclaimer that some bits will probably resonate with you and others won’t. Take what you find useful, and leave the rest behind. I was especially struck by his words about overcoming resistance and greeting writing as a form of mindfulness practice. 3. Some good news: the National Aquarium in Baltimore will soon be moving eight dolphins who were raised in captivity to a protected, oceanside sanctuary, where they will live out the remainder of their natural lives in peace and without public scrutiny. My hope is that this act and others like it will encourage places like Sea World to stop treating aquatic animals as a form of amusement, and to publicly recognize these creatures are here with us, not for us. 4. Another major victory for animals this week: all medical schools in the US and Canada are now completely free of the use of animals (like dogs and pigs) in medical training. This effort is thanks to decades of persistent and courageous activism from PCRM, and it is huge. I’m so grateful to the advocates who have made this possible, and I hope that it comes as happy news to the many pre-med and medical students who have spoken out against dissection and animal laboratories throughout the years. 5. Since I came clean about anxiety and depression in my birthday post this year, small glimmers of relief have started to shine through the bewildering feelings. Because I find it very hard to confide in people directly right now, writing has become a means of remaining honest and open. And since I named the struggles out loud, I’ve actually started to actively seek comfort–or at least a sense of solace through the recognition of shared experience. Laced with the meta-stressors familiar to anyone afflicted with anxiety — shame for being gripped by anxiety in the first place, self-blame for putting oneself in situations known to trigger it, exasperation upon realizing that its predictable trajectory of anguish is underway yet being unable to stop it — the book radiates a wistful yet warm assurance that these overwhelming emotional states, as all-consuming and singular as they seem, mark our membership in a larger fellowship of tribulation in which we are never as alone as we may feel. I nodded and smiled as I read Popova’s review, and perhaps you or someone you love will, too. I’ll be back in a week with another roundup of reads, and with some new recipes before too long. For now, happy 4th of July, again. May the day remind us of the value of freedom and independence for all living beings on earth. Also I’ve been wanting to write for months to thank you again for your kind words as you were in the middle of your journey to step away from the medical school plan and I was in my fertility journey, very near the end. You linked me to a wonderful blog (a blog about love) that provided me with incredible insight and support around years long fertility struggles like mine. It meant a lot to me at an important and very difficult time in my life. I now sit here with my 9-week old baby boy in my lap – it didn’t happen at all as planned but the winding messy imperfect 4-year journey took me to this amazing place in the end. I have no doubt yours will end up exactly where it should – in time and maybe looking really different than originally thought! 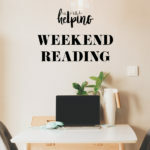 Be well and I will happily continue reading your blog – a real source of inspiration for me. I wish you could have seen the big smile on my face as I read this comment. I remember our exchange very well, and I am so happy to hear that your journey took you to an incredible place. Congratulations on welcoming your son into the world and into your family. I so appreciate your reading my blog and sharing with me. In the meantime, I’m definitely hoping to check out Elizabeth Gilbert’s latest book! It sounds as though it could be very helpful right now. I hope you had a great holiday weekend. I always appreciate your recipes and Sunday posts. Reading about your struggles with orthorexia, depression, and anxiety is helping me work on these issues myself. If you’re in Denver long enough, I hope you can attend VegFest July 23rd and 24th. I know you’d meet plenty of fans, myself included! Stay well and I’ll continue enjoying your blog. <3 <3 <3 So much love for you and these links, especially that cauliflower! And thank you for the inadvertent books about writing suggestions! It's part of my craft I want to continue to hone but never seem to make the time for. Could for sure use some additional inspiration. I ove the idea of a blogger vacation. So healthy and important to take some time out. It’s like any job, right? Thanks too for sharing all thes lovely links.